Gallery Oldham asked members of Art Detective if they could identify the location of a painting by John P. Knight beyond the title ‘Snowdonia’. Andrew Greg was the first to answer the request. 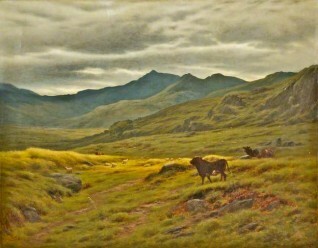 Andrew Greg deduced that the landscape depicts Snowdon from the east on the Capel Curig side. He was able to prove this by pointing out the matching skylines on a photo of the Capel Curig side, which he attached. Michael Westcott also provided an image of the skyline from a slightly higher vantage point. Gallery Oldham concurred and has now added a description to the work. Although John P. Knight began as a portraitist, he was above all a landscapist, working in both oil and watercolour. He is also known for his small genre paintings. He exhibited at the Royal Academy from 1861–1908, became a member of the Royal Institute of Painters in Water Colours (RI) and of the Royal Cambrian Academy (RCA), and was an associate of the Society of Painter-Etchers. In 1874 he was a Royal Manchester Institution prize-winner. In 1891 he won a bronze medal at the Paris Exhibition. He was also the founder of the Manchester School of Art. A profound influence on the school, his style did not conform to the traditional Art school rules, which the Manchester School vehemently criticised. He painted however he desired. Meetings of the Manchester School took place in his studio in Wales, during the 1870s. Can you identify the location beyond 'Snowdonia'?